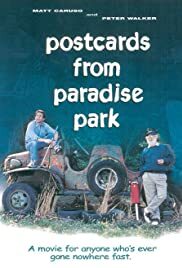 Dramatic comedy about a young ad executive who falls from grace, lands in a trailer park and finds redemption with the help of his new oddball neighbors in Paradise Park. From first-time writer-director (and commercial maker) Curt Crane. A movie for anyone who's ever gone nowhere fast. The film starts slowly and his characterizations of women are much less thought out then those of the men, but the film wins you over by the end. It's truly funny and quite enjoyable. The characters in the trailer park are divine- if only we all could live in such a place!